PPL Electric Utilities provides electric delivery service to more than 1.4 million homes and businesses in Pennsylvania and ranks among the best utility companies in the country for customer service and reliability. With 2,300 employees, PPL Electric Utilities is a major employer in the communities it serves. It is a subsidiary of PPL Corporation (NYSE: PPL). For more information, visitwww.pplelectric.com. “Our region will benefit greatly from the generous commitment of PPL Electric Utilities. Investors in Focus recognize that the regional partnership, a proactive approach to growing the area is more effective and competitive; and benefits all people and businesses in the region by providing increased tax revenues and creating new economic activity,” Focus Executive Director Lauren Bryson said. 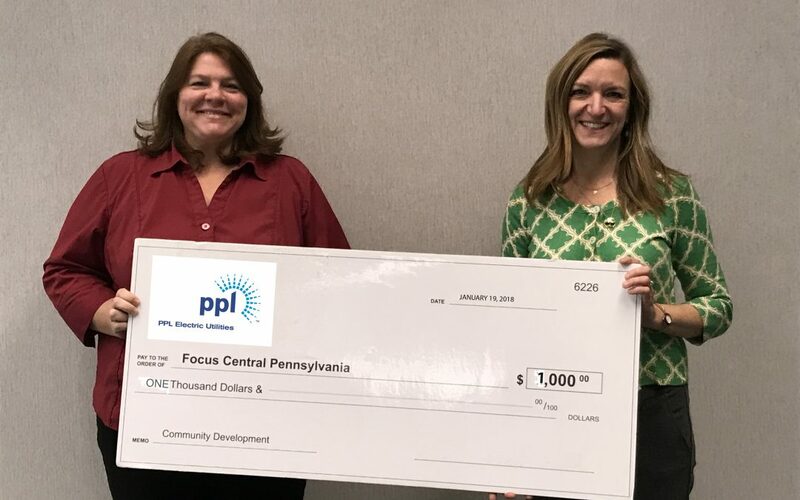 Focus Central Pennsylvania is part of a committed team in the region that is driving economic development for communities in Centre, Columbia, Montour, Northumberland, Union, Snyder and Mifflin communities. The mission of Focus is to attract and support expansion of capital investment that creates quality career opportunities for the families of Central Pennsylvania. Focus pro-actively connects with site location consultants and companies looking to expand. This work helps our communities become an even greater place to live and work.